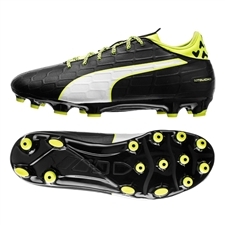 Puma evoTOUCH soccer cleats, wear the fastest soccer boots on the field. You can now find available the Puma evoTOUCH Soccer Shoes. Puma delivers a speed boot that is utilized by world class strikers Olivier Giroud, Sergio Aguero, Falcao, and Marco Reus. Do not get caught a step behind, get into the fastest boots on the field. Check out our main Soccer Cleat section. Get your next Puma evoTOUCH soccer shoes today at Soccer Corner!